Anyway this one will be interesting - anyone with info or pics put them up.. I bet Hammy will take a month to dry not to mention CT, and Lock 4... potential with these are pretty bad depending on how high the rivers and lakes get..
Definitely a bad situation. We got stuck at Toys R Us in Murfreesboro yesterday when a funnel cloud was spotted and some straight line winds came through. We left once it passed, went back 840 and saw three cars off the side of the road in ditches and one was a water rescue. 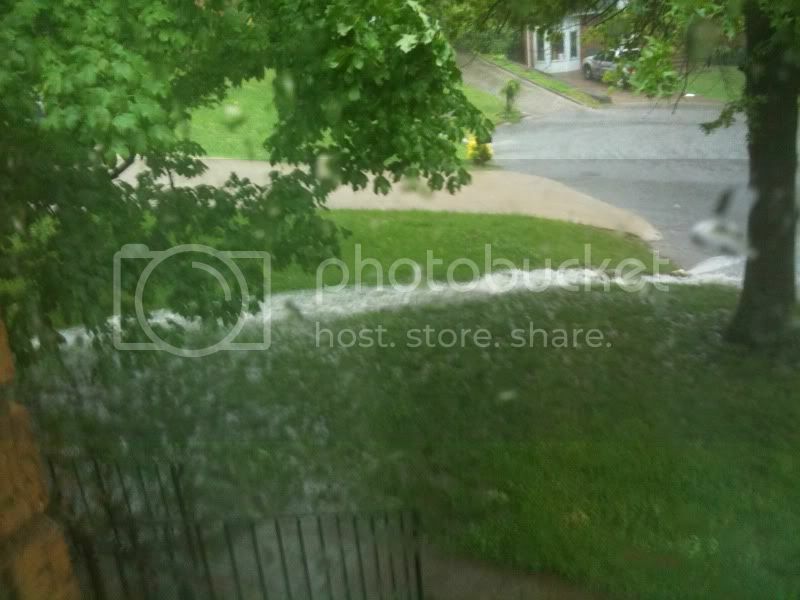 Heres a couple of pics from my friends house, hes in donelson. His basement is partially flooded. Here is 431 at Carriage Park. This is just west on 431 from Mack Hatcher. The water got up over the stop sign which I estimate is about 7-8 feet off the ground. I don't imagine much road will be left when it goes down. According to the news, at least one bridge here in Franklin has washed out. We're vacuuming and will be for a while. At least it can't "flood" my basement, since we can let the water out the garage doors. And no, this is not "record flooding", just look at any soil map, and it will show you flood prone soils. This is just nature. We just have short memories. And we build where it floods. I really feel sorry for renters of crappy property along Mill Creek. I'm sure their landlords did not mention this. 12 + Inches in Mt Juliet (directly across from Hendersonville). Our rain gage overflowed. It's reset now. Vacuuming resuming in 1 minute. Wow! I sure hope you are all OK and minimal property damage. Weather service called for a lot of the same here in Knoxville but we have had hardly any rain, just wind. Shawn posted on Facebook that he took his family into the hallway because they were afraid a tornado was coming thru (Benton, KY). We don't quit playing because we get old. We get old because we quit playing. I'm headed back from Tanasi area - have to get to Franklin and then up to Bellevue. We hear that going 840 to Columbia is the only way. Is Franklin rd to Old Hickory open? Anyone with good recon, please gimme a shout. 615-six six 8 - 4359. We have about 4 miles of trail that are under water or aren't accessable because of flooding, the duck river is supposed to rise 10 more feet by tuesday. We've got nothing here in Chatt. Just a few showers and now we have sunny skies. But there has been mad wind. I so sorry to hear about all your losses and I hope everyone is physically okay. As for Hammy, lets just hope people will use common sense with this disaster. Does anyone make a swamp buggy conversion for a bike? This is the Harpeth By Dotsons in Franklin - this is the old river bed, under this bridge must be 15 feet deep and this is VERY Wide... Talked to a guy from the city and said last night it was over the bridge. I live about 5 miles from all of this, and now that I have seen it I think it will be a while before things are "normal"
I am up on a hill so no real issues of standing water, but we do have a nice river rapid that has formed. We got an urgent message to get over to Taylor's school. Couple hundred showed up to help move books, electronics and supplies from the lower room room pods over into the gyms. 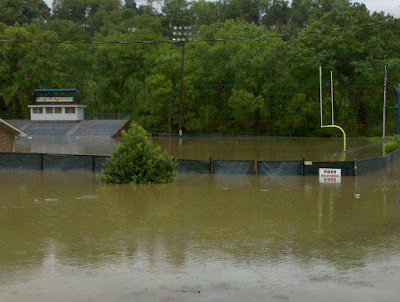 Stones River is along the back side of our football field and crepped up a few more feet while we were their. Be careful everyone. We will check on the trails in a day or so. Had to go out and sight see today. Pretty wild - and we don't flood half as bad as other areas. 15 inches (+/-) at our house in about 36 hrs. Water from Shutes Branch was going over Saundersville Road in one place. 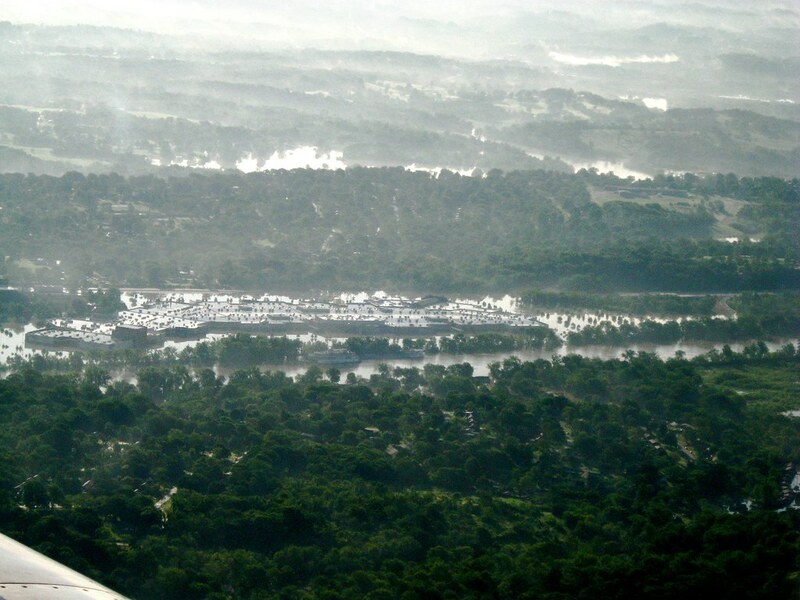 The lowest part of the Jungle was flooded. I would imagine that the dry creek was pretty wide today. Sinkhole flooding closed Needmore Rd just up from the Shutes MTB trail road. Here are some pics on a slide show. no property damage. We have everything on "stilts" and it's more of a nuisance than anything. Just a heads up, over the next few weeks be on the lookout for some MASSIVE potholes on the roads. I've got a few properties in Donelson and all of them look good, some basement leakage, but nothing an open garage door and a broom couldn't fix. Overall, I feel really lucky....but, it's going to be a long time until we recover from this, property values in Bellevue and Antioch are going to take a serious hit in the immediate future. Hope everyone is doing well and trying to stay dry. Moments before the last time I saw my car. I went back and grabbed my bike thinking it would be my only way home, as I got clear with it and a bag the car turned and washed under. The area has now receded and my car has been towed somewhere by someone and no one seems to be able to tell me anything. The water came from run off of the Highland rim, hit the side of my car with enough impact to push me off the road and instantly submerge it. It was insane. Luckily only stuff was lost and not life. Be careful out there. Im glad you are ok and not a tragic headline on the news.Where was the road you were on? Exit 18A off Briley entering 24. Halfway up the ramp the deluge of runoff water running off the mountain down 24 swamped the entire exit exchange. My buddy sent this photo from the news to me. That's the top of my car in the distance amidst the water. I just got home from work. And there are no words to describe what is going on in Nashville right now. And especially on my side of town (Bellevue). There is no way to tell all the stories. Hope eveyone is safe. Last edited by Dook of Moots; 05-03-2010 at 07:46 AM. I almost didn't make it home yesterday. My main road (Harsh Ln) is covered by Old Hickory Lake and there is only one other road leading to my house that I had to wait about 6 hours for the water to go down enough to make it home last night. 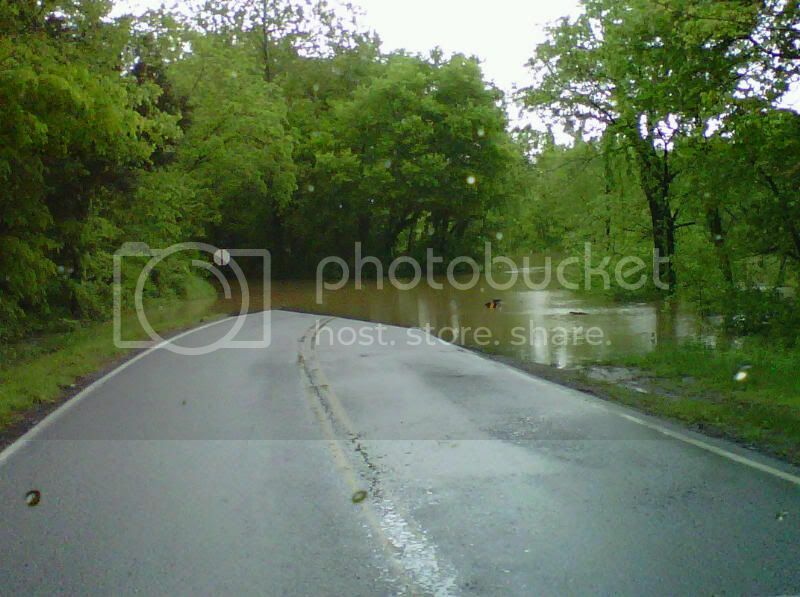 This is Old Hickory lake over the main road leading to my house about 1/8 mile away. My pregnant daughter got innocently stuck in traffic on I24 near Bell Rd., the area captured on news video with the large portable building being swept along Mill Creek. Water came up so fast she could not get out of the car and wound up being pulled through the sunroof by a nearby trucker. 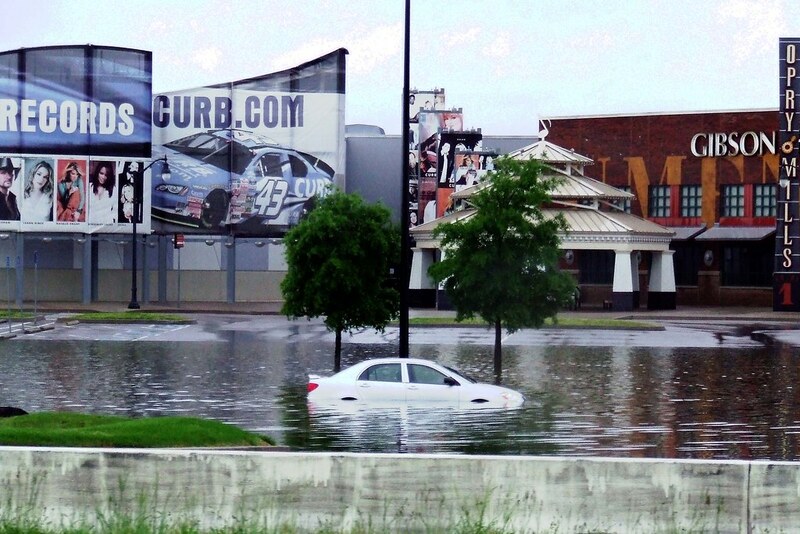 Soon after, her car was completely submerged. We are thankful she and baby are OK. Scary, scary! Have you seen my mad bike skills? I seem to have misplaced them somewhere. Richland Creek spilled over and into a rock quarry - filled it up! The Bellevue flooding video shows the absolute ridiculous level of incompetence of planning, zoning, codes, and engineers regarding flood dangers and new developments. We have done lots of jobs where the plans show "100 year flood levels" and they build one foot above these levels. Most people have very little knowledge of hydrology and buy not knowing what they are getting. It's real sad. The water came up so fast it was crazy. Luckily, we have warned some people about the flood soils present during studies and they adjusted accordingly. But, most of the time it's too late and they have deaf ears. Most folks will get a home inspection, but it won't include a hydrologic or geologic review. And even then, getting a good review done would likely be iffy. Also, there are probably numerous slope failures, hill side movement, and sinkhole dropouts this weekend. Dan - That's scary - glad she and the baby are ok! Last edited by TNcaveman; 05-03-2010 at 07:47 AM. There are still people stranded in there homes and neigborhoods in Bellevue. We are not even able to get boats to them. The Fire Dept did 600 water rescues yesterday. And it's not over. We could not even get Ambulances in to some places. PTJ is even stranded in a neighorhood behind loveless. He and his crew where there working to restore power to the area. They got caught by the riseing waters and couldn't get out.. I think he been there since early yesterday. And I believe he's been at working since Sat. Last edited by Dook of Moots; 05-03-2010 at 08:02 AM. Looks like RFR has been devastated by the flooding too.. to think of all the hard work and generosity that was put into the new building.. The Bellevue flooding video shows the absolute ridiculous level of incompetence of planning, zoning, codes, and engineers regarding flood dangers and new developments. We have done lots of jobs where the plans show "100 year flood levels" and they build one foot above these levels. I'll admit that there is a lot of bad engineering out there but this is potentially a 500 year event. Hard to design for. They'll be plenty of easy targets for throwing stones before this is all over. I think a similar flood happened in 1979, maybe even twice in that year. 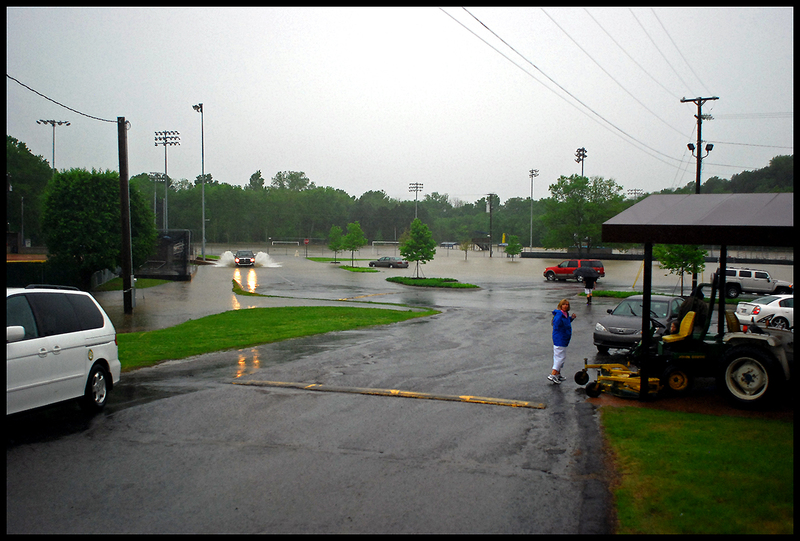 Regardless, this isn't the first flood in Bellevue...and won't be the last. It's sad that hardly anyone has flood insurance, so at the moment, the home owners are stuck with the bill. A buddy of mine lives in Ashland City and has been selling insurance for the last 6 years. He has NEVER sold a flood insurance policy, although they ask each person if they want earthquake and/or flood insurance because it's not protected in homeowners policies. 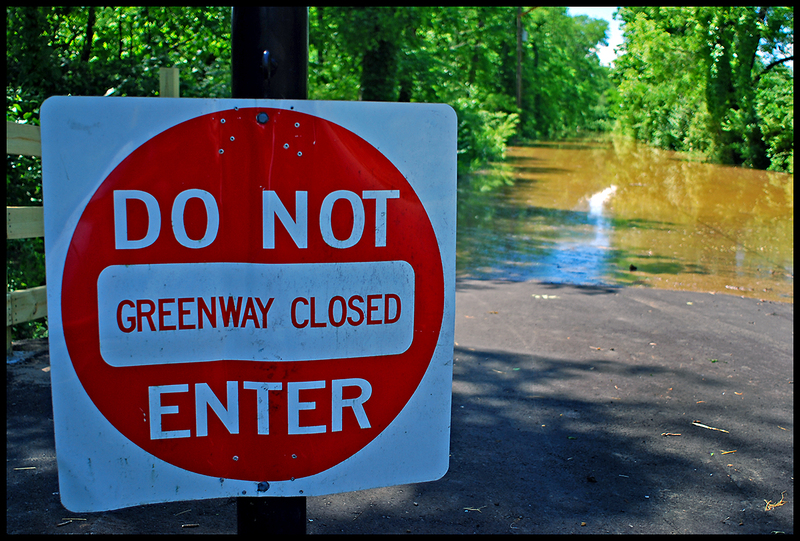 Each person says no (unless it is required becuase they live in a flood plain). It's very expensive and the prices are rate conrolled by the gov't, so State Farm will have the same rates as Liberty Mutual, etc. I'm assuming there will be lawsuits out the wazoo before this is said and done, but look at Katrina and the mess they are STILL fighting. A very similar situation and many of those folks did not have flood coverage. Regardless if the home owners get a lump sum later down the road, they still need a place to stay now. All this is crazy! I am lucky and live in a high elevation area and was not affected. A sister of a friend of mine had to be lifted by helicopter from her home in Franklin. They had to leave everything behind, but they are ok. Hope everyone else is ok.
Yeah, to those of you that live near downtown Nashville, good luck! I have a friend in Bellevue, the road in his neighborhood was litterally stripped down to the original pavement which was two coats down. Incredible the power of water! I will never forget the videos from I-24 when all of this started....just stunning! Few pics from today. It was slow at work today, so Adam and I went out for a ride around Hermitage to check out the area. So I had to take the camera with me. DCA as of Monday around 1. But it probably has gotten worse. This has been the worst flood I have ever seen at Chickasaw. I have a link to pictures I took at the bottom of this email. There will be an unofficial work day this Saturday to assess the damage and to start clearing log jams and fixing erosion. I will be at the shed at 8 a.m. Saturday for the work day if you can’t come at 8 we could sure use the help later in the day, or any other time. At 4:30 this afternoon the entire river trail was submerged, most of the creek and ravine trails were under water and sections of black hills and trail of tears were affected. Fieldstone Farms by Cotton Lane is a mess totally under water the fields by the road still look like lakes..
Pinkerton Park is still under water and the Harpeth still flows in its old banks.. But 96 is now open into Franklin so now there are two ways in / out.. 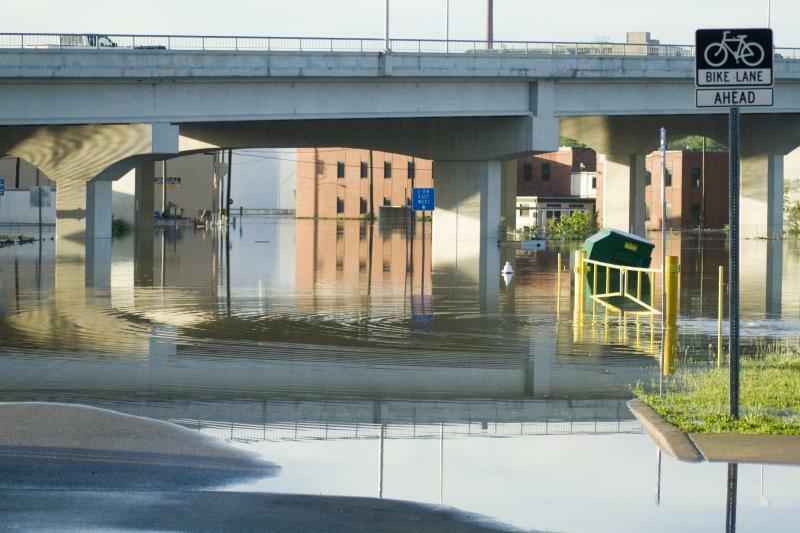 Anyway, some things simply can't be built "unfloodable" - especially roads. The cost to make a bridge longer or higher gets exponentially more expensive. Luckily, this kind of thing is somewhat infrequent. "...........15 inches in about 24 hours. Our next door neighbor was worried it might flood...........but I wasn't. I'd never seen the water more than a few feet deep on the Flood Plain and we were a good 20 feet higher. Hmmmm. 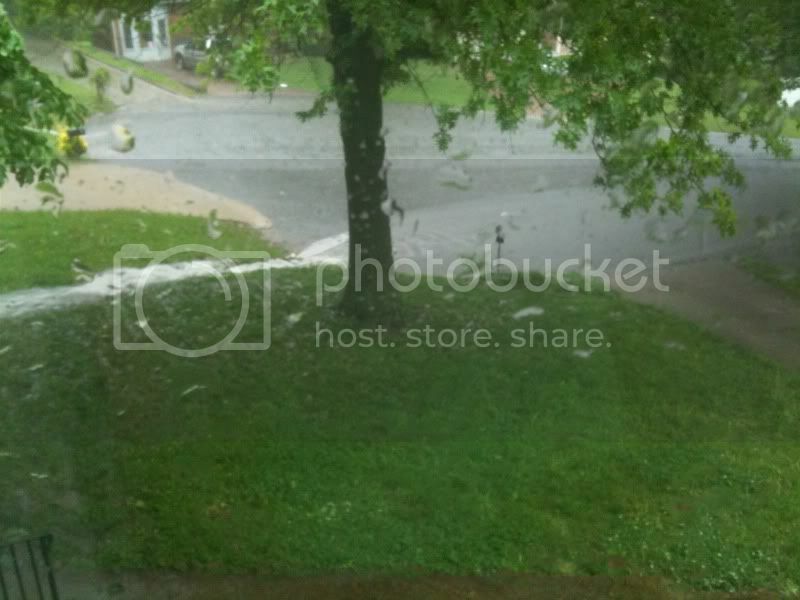 A little later I look out the front windows and stuff is floating down our drive. I run tell Betty we have to leave in 10 minutes. To grab a change of clothes and her medicine and we were gone. We just barely made it out. We could only find one route out where the roads weren't flooded and impassable. We gave our elderly next door neighbor a ride. She had a heart attack about 2 hours later while she was still with us. She is now in Intensive Care. 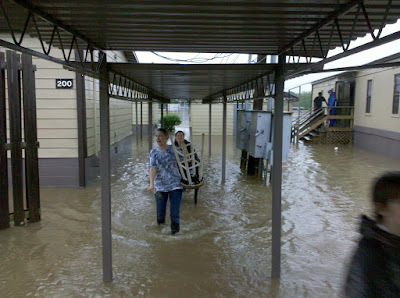 Over 40 of our neighbors were trapped upstairs and had to be rescued later in the day by boats. Two of our neighbors drowned trying to escape. We were able to get back in this afternoon. The water was about 4 feet deep inside the condo. All the furniture floated around and is totally ruined. The doors are warped and ruined, I guess all the appliances are ruined, the rugs are ruined, the the drywall is ruined. The cabinets in the kitchen and the bathrooms are ruined. I think the roof is OK. Lots of mud everywhere. The pictures on the wall were high enough that they are OK. I guess the pictures were the only thing downstairs that weren't ruined. 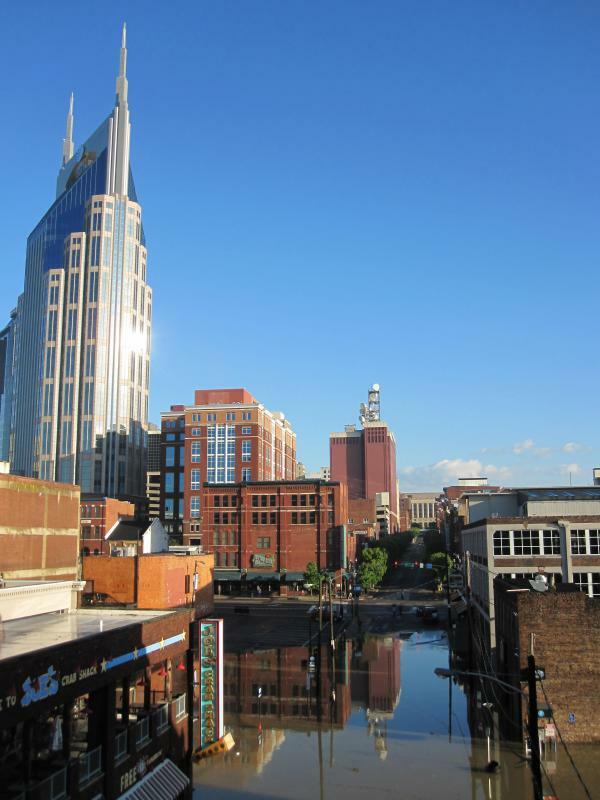 [QUOTE=Simann;86682]Yeah, to those of you that live near downtown Nashville, good luck! That car actually belongs to a friend of mine's wife. Now, you can't see the thing at all. They say it could be a couple of more days before they can try to find and retrieve it. Thanks to PTJ for his hard work, hope he gets some rest soon! Anyone know if the square in downtown Franklin and The Factory got flooded? The Factory was never under any threat from the Harpeth could have just drainage problems though..
What years were those floods? This is certainly record rainfall, just wondering when those happened. That info flies in the face of everything else I've heard - including countless old timers telling me they've never seen anything this bad. Someone posted this on my wifes facebook page, found it on YouTube, have to watch the whole clip. If that would of happend here. You would have seen some tracker trailer truck trying to drive across it. I think it was in 1938 and another in 1979 that Nashville flooded. 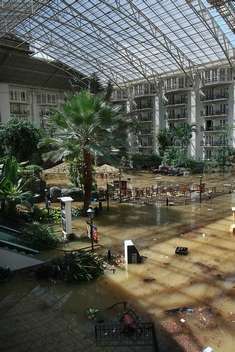 I too have seen Opryland get some water, but not this much before (I'm only 28). It comes with the territory building that close to a river. 1979 was the last Mill Creek flood. 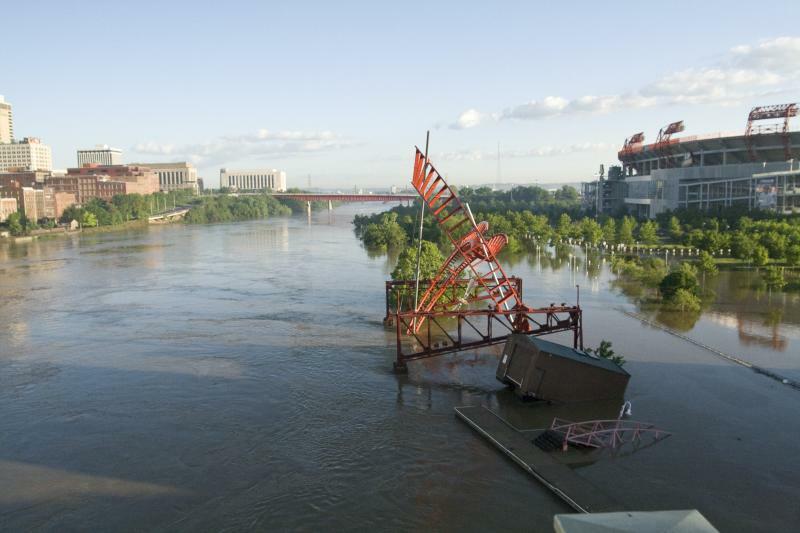 I heard in a news report over the weekend that Mill Creek crested at like 24' in 1979. At some point over the this past weekend it was at 26'. ^didn't hear about that. I know in 79' after that flood, they went through and scraped/cleaned out Mill Creek, wonder if they will do that again. did they ever find those 2 guys who fell off their inner tube raft on mill creek? We went to Kingston Springs yesterday on a pro bono site visit. This is the wildest thing I have ever seen. I'll post up some videos, pictures, and a map - it was incorrectly mapped as not being a flood zone. 6 houses washed away - all that was left were the slabs and a few blocks. Simply incredible. 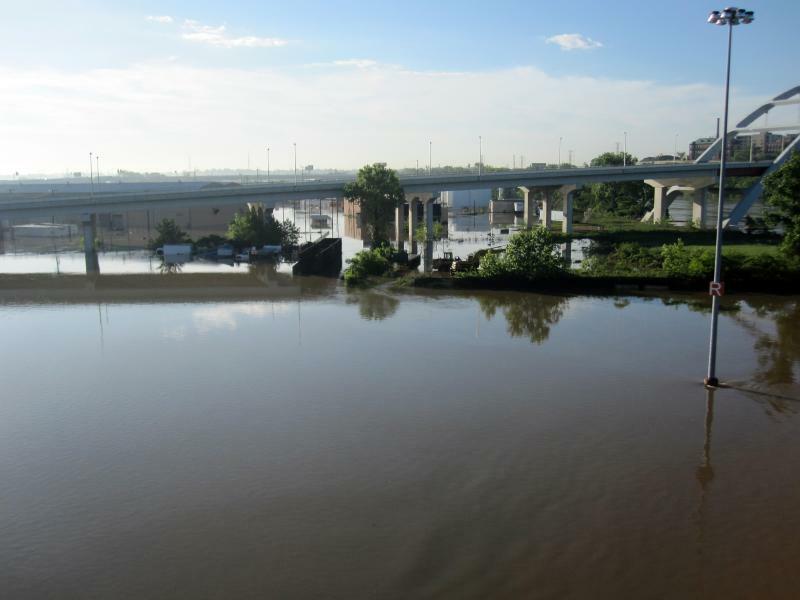 The Harpeth was flooded "wall to wall" - the entire floodplain. And the place we went to was a meander cut-off overflow route that the river took.